This spring’s cherry blossoms have been absolutely beautiful in the Anniversary Orchard. It’s been mentioned previously that meditating on the simple, perfect beauty of cherry blossom has long been a Japanese past-time, and for good reason. Their fleeting but exquisite beauty stays in the mind’s eye, and when recalled even when they’re gone, the memory is just as enchanting as experiencing them again. Recalling cherry blossom can be powerfully healing too; amidst life’s challenges one sometimes has to ‘count to ten’, or ‘take a deep breath’, but a technique for calming the mind that beats these is to imagine everything falling away and recalling cherry blossom, either massed on trees or just a single one. Kendo has pointed out that visualising cherry blossom shares something with meditation – temporarily stepping away from all one’s concerns seems so counter-intuitive to the western mind, but intuitive is exactly what it is – your intuitive self can’t speak to you and guide you with wisdom that’s beyond mere rationalisation unless it has the space to do so. If you’ve already done this you’ll know the benefits, but if not, Kendo strongly recommends that you suspend disbelief and try it. 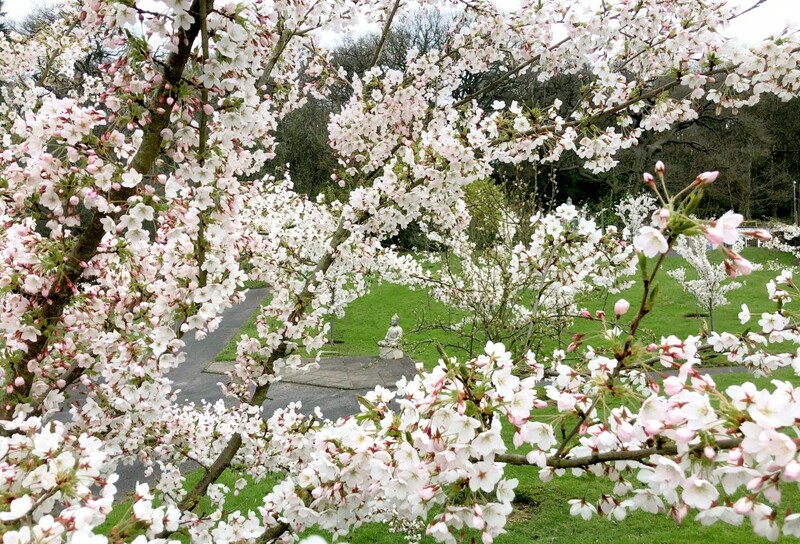 Whatever challenges you may face, Kendo hopes that the exquisite picture of this year’s cherry blossom can help you find a moment of peace and pure, simple beauty upon which to meditate, and find the pure, intuitive wisdom that lies within you. A phrase we often hear concerns ‘the meaning of life’. We hear it so often that we are unlikely to analyse it, but simply assume that it relates to things like whether there’s a higher principle to work to, rather than just surviving our day-to-day experience. For many, living by principles or commandments serves to steer their actions in most admirable ways, by reflecting on whether they are keeping to those guidelines. Kendo would always applaud such aspirations to good, constructive, pro-social conduct, because it will mean that in so doing, you are being the best you can be. The meaning of your life will therefore arguably be rectitude, or rightness, a proactive and deliberate force for good. Typically of Kendo, however, he recommends that we do engage in a little analysis, and even a thought-experiment or two. Kendo suggests that we view life as a dynamic and complex thing – something that necessarily goes beyond ‘meaning’. Words have meaning, but the forces of nature cannot be encapsulated so easily; the wind has no ‘meaning’, any more than do the tides, or the sun, or gravity. They have effects that can be good or bad, depending upon the situation – a breeze on a hot day can be pleasant, but a typhoon can be devastating. Kendo would counsel that like these forces of nature, even the most innocuous of our actions can have positive or negative consequences. So, life can be a ‘force’ which has ‘effects’ upon others, and already this is beyond mere ‘meaning’. But what about going further? If you go beyond asking, ‘What is the meaning of life?’ to asking, ‘What is the meaning of my life’, you have narrowed things down from a global and nebulous concept to considering the effect that you personally have on the world and the people around you – a big step forward in terms of awareness. If you then ask yourself what is the effect of your life you have then elevated your self-awareness to a higher level; seeking to be objective about how you impact others shows a higher degree of consideration for others, and sensitivity for the nature of your actions. Unsurprisingly, Kendo recommends that we take things one step further: what is the purpose of our lives? This degree of self-reflection is highly enlightened – you have not only considered the effect you have on the world around you, but what fundamentally guides your actions. This is where the thought experiment comes into play. Kendo says we should remember that society existed before we were born, and it’s qualities were determined by actions taken by other people before we had life. We must then react (ideally in an enlightened way) to the society in which we find ourselves, and – also ideally – come to realise that our own actions affect not only those around us in the present, but those who have yet to be born. Kendo says this perspective shows us that we not only shape the present, but the future. Such a realisation will affect the conscientious person; whilst we all ‘live in the moment’, sparing a thought for the future that our actions shape adds a new dynamic – in fact a new purpose to life. We should all aspire to ensure that the future is as positive as it can be for those who have yet to be born into it – we will shape their experiences, and we should do our best to ensure that they are as positive as possible. Kendo’s bottom line here is that we are all self-aware, but are we aware of the quality of our self-awareness? If so, our lives will have so much more than an arbitrary ‘meaning’ – they will have a dynamically positive purpose, and the positive effects of your life will live beyond you. Now that means something! When facing challenges, it’s natural to concentrate your energies on ‘fighting back, ‘steeling yourself’, and ‘keeping things together’. Determination is the response of the strong, and, frankly, it’s what we feel we ought to do. However, this focus on yourself necessarily narrows your horizons and tends to shut out the rest of the world, which almost invisibly can make you feel alone with your problems. Why is this so? You’re being brave and preventing a problem from overwhelming you – why should you then feel more isolated? Kendo advises that once you’ve gritted your teeth and ‘battened down the hatches’, however well this helps you cope with your situation you may be overlooking your connection to the outside world and the many ways in which it can help you. The two key things that are illustrated during a visit to the Nagasaki Retreat are stilling the mind and re-connecting with the ‘big picture’ of nature around us. Both of these things are very easy to forget in the busy, individualistic, technological western world, but once remembered, they can greatly help us to meet our challenges – and get help. Anyone who has followed Kendo will know the benefits of taking a ‘Kyu Shin Do’ approach to challenges – resolving to put one’s problems at a safe distance while finding absolute Zen peace – but also remembering that the natural world around us is fundamentally benevolent to those who respect it can really help too. Appreciating the big picture of nature is a gesture of humility which takes ego (and therefore isolation) out of the situation; by stilling your mind and remembering that you are a part of nature around you, not only are you liberating your intuition but you’re also opening yourself to all the positive energies around you. Kendo counsels that even when problems can seem overwhelming and meditating is the last thing on your mind, it really should be the first. Becoming the best that you can be necessarily involves facing-up to and overcoming challenges, but there’s no need to suffer in silence nor face things alone. This is a choice that will always be open to you, and making that choice will not only help you, but it will keep you in touch with the world around you and all its supportive energies. Even when things are difficult, suspend disbelief and still your mind; at the very least you’ll benefit from a ‘re-boot’, but also remembering that you’re part of something bigger and benevolent will make it easier to reach out for the help you need – it is certainly out there and available, if you remind yourself that there’s no need to suffer in silence or isolation. It’s Christmas time again and we all share in the positivity of the season, but it’s not so easy for those facing challenges, whatever form they may take – ill-health, relationship difficulties, or insecurity, whether personal or of one’s home. At such times, when the contrast of the jollity surrounding us can seem at best ironic and at worst even cruel, Kendo advocates courage. But not simply trying to steel ourselves – he means enlightened courage. What does this mean? The first thing to do is to try to discriminate – over our feelings. It’s important not to worry over the external things we can’t change; doing so risks overwhelming us when we need to be most aware of ourselves. This isn’t just being self-absorbed, but sensibly considering the one aspect we can make a difference with – ourselves. Taking a KyuShinDo approach to our external circumstances and placing them at an objective distance makes it immensely easier to think clearly and – more importantly – feel clearly. This leads to the next phase – positivity towards ourselves. Of course, we should always strive to do the right thing with the external circumstances of our challenges, and this in itself should give us confidence in ourselves. However, in the midst of dealing with our challenges it can be all-too easy to be consumed by them and forget ourselves, It really is worth remembering our innate Buddha nature – our essential goodness. So – take a moment, step away from things, find a Zen moment, and remember that you are more than the circumstances you face – much more. Following Kendo’s advice when facing challenges can therefore give us courage – and strength and peace of mind, and perhaps most valuable, the ability to appreciate the positivity around us, both at Christmas time and at all other times. All at the Kendo Nagasaki Foundation wish everyone a happy and peaceful Christmas, especially those who find themselves facing challenges; we hope that Kendo’s counsel helps you to enjoy the season. Kendo’s healing message for November 2018 is simple and requires few words, yet it should give rise to contemplation of something equally simple yet fundamental to the human condition – self-sacrifice. As we commemorate the centenary anniversary of the Armistice which ended the First World War, we should remember the self-sacrifice made by so many in pursuit of a higher ideal, which was the preservation of the liberty of our nation. There are two principal aspects to recognising such acts: firstly, it should inspire us to consider the ways in which we could be self-sacrificing for others, but also, it is an act of humility. At one hundred years on we are unlikely to know anyone from the Great War, but we may know or have seen or heard of people who have also served, who have put themselves in danger for others for others, most of whom they probably didn’t even know – us. The centenary of the Armistice is a touch-stone for all such brave and selfless souls, and should give us a sense of perspective. As good as we think we are, as well-rounded and generous as we consider ourselves, most of us have not been asked to make such sacrifices – our world is safe, ordered, and largely free from threats. Most of us would not hesitate to join any effort to do what is right, but because our world is so safe, even the possibility of such a need never arises, so the thought of acting in such ways never crosses our minds. The exception is those who do serve and all those who have served. They act and have acted with courage most of us will never have to find, with dedication most us have never been required to show, by being ready to be self-sacrificing for people they don’t even know. Kendo’s healing message for November is to think about those who have chosen to live and act by such excellent principles. Doing so will put our lives into a new perspective, which will hopefully inform our approach to everything in our own lives; being so aware, we will be more ready to recognise the needs of others, and even the smallest gesture of self-sacrifice could make the world of difference to someone in need. Between this healing message and the next, Kendo’s story will be published – the man behind his mask has written his autobiography. “Kendo Nagasaki and the Man Behind the Mask” is an astonishing read, the complete life story of the man who has channelled Kendo for the last 54 years, from his birth to his present incredible support for the Lee Rigby KNFoundation; indeed, absolutely all the sales of the book will be donated to the Foundation. Whilst being a human story, it also describes the origins of Kendo’s mysticism, but in order to satisfy the long-standing demand for background on Kendo and his life in wrestling, this is this book’s focus. Much more will follow about Kyu Shin Do and Zen, but the man behind the mask has decided to begin his writings in this way – and it’s been a remarkable decision. Whilst Kendo has always been a highly public figure the man behind his mask has valued his privacy, but he’s decided to renounce it now solely in order to benefit the Lee Rigby cause. It’s a gesture of self-sacrifice and philanthropy, and an admirable example to us all. If the man behind the mask can sacrifice his anonymity to help others, what could we do or give? There is, of course, an unseen dimension to these developments; the man behind the mask is about to celebrate a birthday which has particularly auspicious meaning in Japanese culture, and Kendo himself would seem to be entering a new phase of expression; we should watch this space with interest! The same dynamics still apply – the man behind the mask still meditates and channels Kendo’s wisdom, and his healing message for October is that we should be always open to being inspired as to the ways in which we can help others – as has the man behind the mask. This remarkable development is inspiring in itself, and knowing Kendo there is much more to come – onwards! Kendo has previously mentioned the subjectivity of needing healing – how personal and intense such a situation can be; now he’d like to consider the ways in which a need for healing can be a lonesome experience too. There are, of course, many ways in which healing can be needed, from a physical ailment or difficulty, to stress, and also an emotional need, such as the aftermath of a trauma. It’s often been said that time is a healer, which is is, but being only part-way through a healing process means that one’s situation is still acute, still raw, still difficult to cope with. Kendo has observed that those in need of healing can find their situations are even more difficult to deal with because no-one else can understand how keenly they feel things; being in need of healing can also make one feel distressingly alone. Kendo would point out that one is never actually alone. Even in the absence of other people, there is a whole natural world around us, one which is elegantly self-regulating and self-healing, and we must have faith that this process applies to us too, as parts of that greater whole. Kendo would counsel that it’s not just time that’s the healer, but one’s own nature is constantly striving for balance, which it will gradually find. Simply putting faith in that constant positive movement will be a big help along the way – having confidence that it will happen will take stress out of the process, which will make the healing journey easier and quicker. This is particularly true of emotional wounds, such as one feels after being wronged. Kendo would always encourage us to believe in natural justice and rectitude, and that one wrong done to us doesn’t prove that the universe is an intrinsically bad place. It’s quite the opposite, in fact, and our faith in ‘rightness’ and wellness and balance helps keep the whole big picture of the natural world in positive balance. Kendo has always said that thinking right leads to doing right, which leads to our own lives being the best they can be, and, by extension, the lives of everyone around us; he counsels that however alone you may feel in whatever difficulties you may face, remembering the intrinsic ‘rightness’ of life keeps its momentum towards wellness and goodness. That small positive shift in attitude, even in the face of difficulties, has positive consequences far beyond what we can see from a position of needing healing. Kendo’s healing message this month is to keep your faith in the good, and it will come to you. Kendo is acutely aware that a need for healing can be an acutely subjective position to be in. It’s inevitable that whatever is not right with ourselves or in our lives draws our focus to the problem to at least a small degree, and sometimes it can command a great deal of our attention. However, Kendo raises our awareness of this phenomenon because understanding this and acting on it in the right way can immensely help with actually becoming healed. Anyone who’s visited the Nagasaki Retreat has heard about the greatest gift of being in the grounds, and that is the understanding that we are a part of the beautiful ‘big picture’ of nature we experience there. Amidst such beautiful surroundings it’s easy to connect with nature and feel a part of it, easy to let our personal subjectives selves fall away and appreciate that we have a place in something bigger and immensely elegant and benevolent. That connection itself is healing. It’s more difficult to make that connection when we’re in the midst of our busy lives, especially if we are conscious of a problem that we feel needs healing energies. Meditation is a huge help, of course – stilling the mind and liberating our intuitive selves brings wisdom and perspective, and, of course, freedom from anxiety. But we are westerners – between meditations we look to the mind for all our answers, and this is where some of Kendo’s perspectives can be so helpful. The one he wishes to illustrate in this message is the subjectivity of needing healing, as described above. The closest parallel to the best approach to our own needs is his stick-burning ceremony – here, the ceremonial stick is ritually burned, releasing the hopes and wishes we’ve written on it to the power of nature. We’ve done all we humanly can, so now we surrender the matter to a greater power, outside ourselves, but to which we have made a connection. It’s a meditative and mindful experience in itself. However, we can take this action further. Whatever our need for healing, having done everything within our power, Kendo recommends that we leave the problem in the hands of nature’s big picture, and then consider the needs of others. There is a world around us within which are many needs for healing besides our own, and if there is anything we can do to help others, we strengthen nature’s ability to heal everyone who needs it, as well as ourselves. Anything we can do will make a difference, including reaching out on any level and supporting charities which help others, but simply having a caring attitude towards all who need healing strengthens that power for everyone, including ourselves. As Kendo points out, this is a perspective, a new way of looking at things – having done all we can for our own well-being, we should consider that of others. It’s an act of humility, of generosity, of selflessness, and of concern for the quality of our entire society. This may be the most useful meaning of the phrase ‘Heal Thyself’ – doing so by caring about others and what we can do for them. One of Kendo’s favourite concepts is known in academic circles as ‘Sui Generis’ – it means ‘in and of itself’. Kendo recommends that we apply it to all things in life, and most importantly, to ourselves. To know something ‘in and of itself’ means to know it solely by its own qualities, and not by any opinions that others may hold of it or the ‘genre’ to which it’s generally felt to belong. It’s an exercise in discrimination to look at something objectively and find its innate truth, and doing so can yield surprising results. Perhaps the most accessible example is music. If we take the blanket decision that we don’t like a particular kind of music we will never have the opportunity to discover the jewels of songs that can truly touch us. This is even clearer with artists – if an artist is known for a particular style, we may never give any of their work the chance to reach us, but the melodies, the harmonies, or the flow of just one of their songs may take us on a deeply rewarding emotional journey which would have been impossible if we’d relied solely on indiscriminate blanket opinions. Kendo acknowledges that this applies to people too – people from different walks of life, different incomes, different races, and blanket judgements are as inappropriate for any one of them as for anything else that may be worth knowing, if we just give them the opportunity. Perhaps the most acute manifestation of knowing something ‘in and of itself’ applies to ourselves. There’s a somewhat cynical quip about materialism, which describes it as ‘spending money we can’t spare to buy things we don’t need to impress people we don’t like.’ When hearing this, most of us give a wry smile because we know we’re at least partially or occasionally guilty of the practice described – but why? Isn’t it true that the best people we know are simply not bound up in such nonsense? Kendo concedes that it’s impossible to be a part of society without ‘playing the game’ to some extent at least, but the intriguing parallel here is that taking an objective Kyu Shin Do view of our lives is as valuable as doing so with our minds. Find deep peace, and place everything day-to-day at that Kyu Shin Do distance, where you’ll be able to see all their merits, ‘sui generis’. You might find that much of what you do is actually relatively unimportant compared to peace of mind and strong values, and when you do this with what’s in your life, you do it for yourself too – your own essential self is revealed, uncluttered and unencumbered by trivia. Kendo recommends that we do this exercise regularly – it can be most revealing about who we really are. Have we been so engrossed in ‘playing the game’ that we’ve lost sight of ourselves? There’s nothing to be afraid of and everything to gain; as we discover ourselves ‘sui generis’, we become ever-more true to ourselves and ever-more able to see clearly what really matters in our lives. Then, other often-quoted but more positive maxims begin to apply – we come to really know our essential selves, and then we can truly ‘know god and the universe’. One of the most poignant questions ever asked by the great philosopher Socrates was, ‘What is the value of an unexamined life?’ Kendo gives you the tools to do this job, and achieve a truly valuable life. And, as Kendo so often points out, when you are the best you can be, you help the world around you become the best it can be too.